So far, Doctor Doom has won every round. With an army of indestructible shock troops, a horde of enhanced super-villains, and a new and terrifying level of personal power at his disposal, Doom is ready to crush the Fantastic Four, Storm and the Panthers for good. The only chance our heroes have to survive Doom’s deadly game is to change the rules. Enter: Deadpool. The fantastic Four, T’challa, Shuri and Storm do battle with the new Doombots. They are on the losing end until Shuri introduces her Vibranium panther suit and and weapons. They take down the Doombots and then convene. Outmaneuvered Shuri takes charge and decides it’s time to take the fight to Doom and dispatches multiple teams lead by the superheroes with the Adored ones as soldiers. Doom realizes this new strategy is Shuri and not T’challa or Reed. The teams are successful but with many casualties. T’challa and Reed disagree with Shuri’s methods but she holds firm that they must act decisively NOW! Her words cause T’challa to realize that Doom has out thought them and they need to either go crazy or do things out of character in order to make a dent in Dooms defenses or to take him down. Declun warns Doom that he is sacrificing all of his safe houses which have been his ace in a hole in many a past battle. He claims he does not need them as long as he can finish his work here. The teams are taking a beating when Doom finally finishes his master work. He adorns the new Vibranium faceplate for his armor and uses it’s power to all but kill each team. Storm reports in that her entire team is dead, Shuri is injured and down and most of the fantastic four have disappeared. T’challa has had enough and makes a call for. 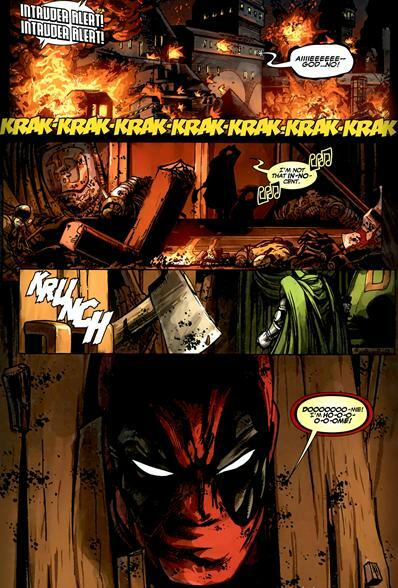 In Latveria home of Doctor Doom a Deadpool arrives in disguise and kills their border patrol and makes his way into Dooms castle. he sets it ablaze before announcing his arrival to Doom. The art matched the story’s tone very well, Scott Eaton turns in some great work! 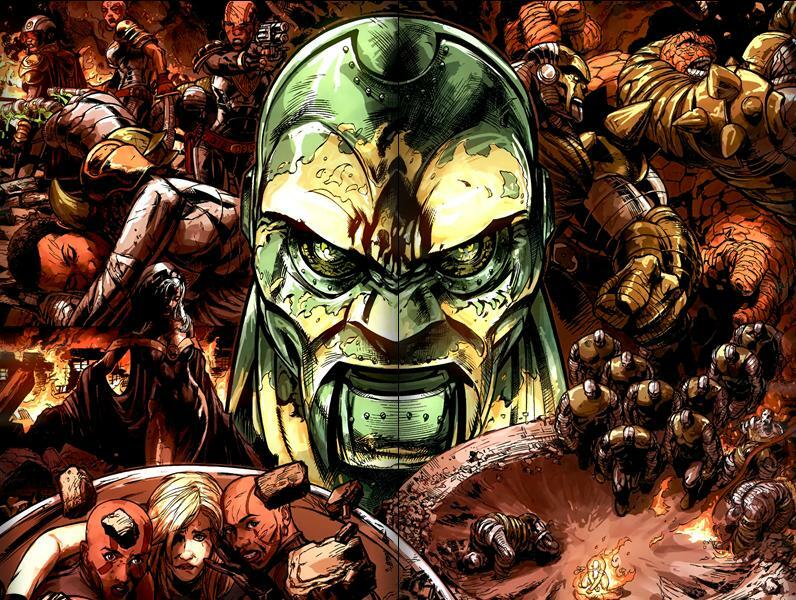 Doom continues to Shine as a villain worth his weight in the ink used to illustrate him. T’challa and Shuri continue to have a great divide in their approach to to the war and what each of them is willing to do. T’challa and Reed both brilliant are caught upstream without a paddle as Doom out thinks them at every turn. Shuri has a more battle ready tech dependent approach who is more than a bit willing to sacrifice soldiers to win. T’challa makes a fateful decision here which shows him turning away from ‘Logic’ and embracing a more loose and unconventional approach to things. 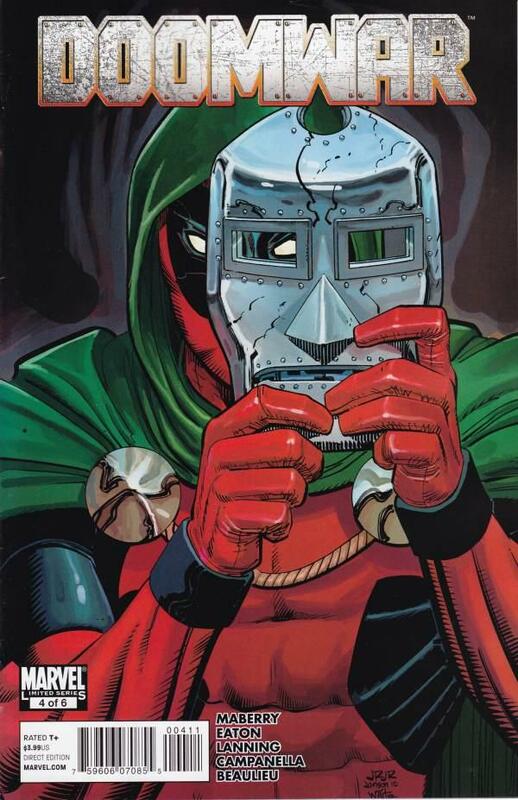 By enlisting Deadpool he certainly introduces a wild card straight out of left field sure to cause a healthy dose of murder and mayhem even if he will be pretty useless in a straight up fight with Doom. The issue also marks the genesis of T’challa leaving Wakanda to Shuri while going off and doing his own thing. Deadpool on the cover just seems like a way of cashing in on his recent popularity. This issue fell short of the first and second in terms of quality.